After the surprising success during its first release earlier this year, the Jordan Brand will release a new colourway of the Jordan Sky High Retro, which was first released in black, white, and blue colourways. Although the Jordan Shoe lovers were still puzzled on where the shoe model was patterned, the new Team Red/White is still expected to be a hit in the market especially during the Holiday Season. 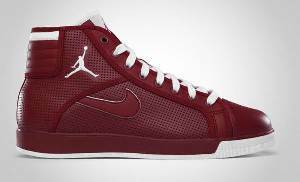 Tired of the old-looking Jordan shoes? Then this one is definitely for you, a sneaker with a new simple but elegant design that goes with performance-based excellence. Check out the market this Holiday Season for its release!